Farms, and details of the farmers from census records and trade directories, plus acreage from the 1919 Estate sale where applicable. 1789 Right of Common for 210 sheep & 42 cows. 1851 "farmer of 180 acres employing 4 men". 1861 "farmer of 180 acres employing 5 men & 2 boys". 1871 "farmer of 180 acres employing 4 men & boys". 1881 "farmer of 182 acres employing 3 men & 4 boys". Duchy Farmhouse is now a private dwelling. 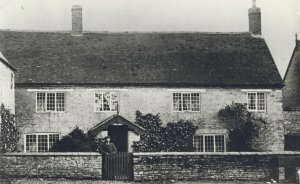 Manor Farmhouse - the wall at the front has since been removed. Listed as 288.2 acres in 1919 sale catalogue. 1851 "farmer of 285 acres employing 6 men". 1861 "farmer of 285 acres employing 7 men and 3 boys". 1871 "farmer of 285 acres employing 9 men & 4 boys". 1881 "farmer of 270 acres employing 7 men & 3 boys". Listed as 393.4 acres in 1919 sale catalogue. 1851 "farmer of 390 acres employing 10 labourers". 1861 "farmer of 391 acres employing 9 men & 5 boys". 1871 "farmer of 650 acres employing 15 men & 5 boys". 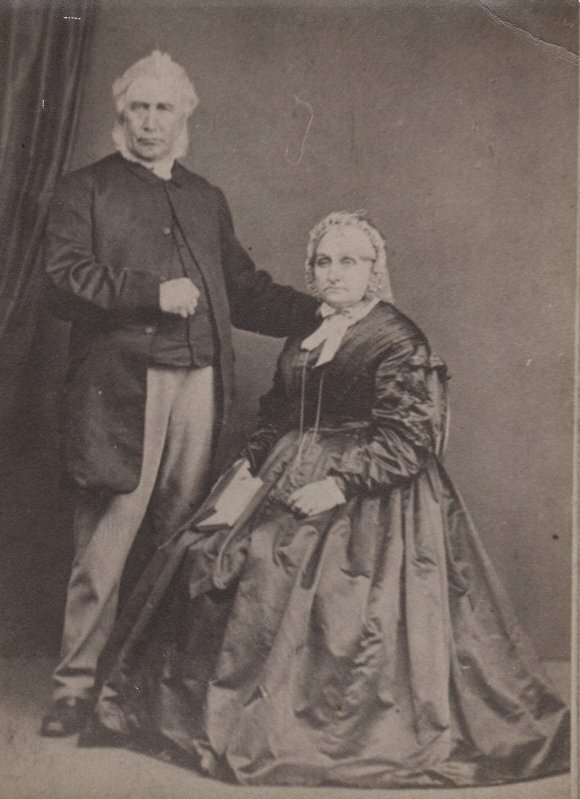 James and Mary Ann Osborn Browning in 1863. By kind permission of his great great granddaughter Jessica Leslie, San Antonio, Texas, USA. 1881 "farmer of 390 acres employing 7 men & 3 boys". In 1880 he is listed as a Hon. Secretary of the Annual Flower Show. In 1889 a fire in the farmyard destroyed 9 stacks and number of outbuildings. In 1895 he was elected as the first Chairman of the Parish Council. 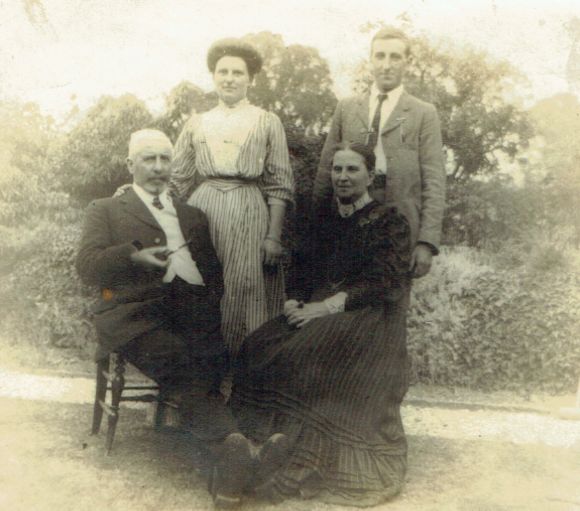 E. Jabez Browning, with wife Rebecca, daughter Dorothy and son Bernard Manning. Taken in 1908 at Rock Farm, Harlestone. By kind permission of Jessica Leslie, San Antonio, Texas, USA. Listed as 22.7 acres in 1919 sale catalogue. 1881 "farmer of 20 acres employing 1 boy". Top Gate Farmhouse is now a private dwelling. 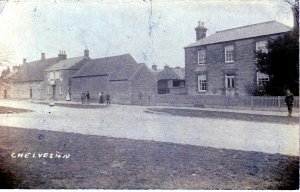 Listed as 118.8 acres in 1919 sale catalogue - now in Stanwick parish. 1851 "farmer of 118 acres employing 3 men". 1861 "farmer of 116 acres of land employing 1 labourer & 1 boy". 1881 "farmer of 120 acres employing 2 men & 2 boys". 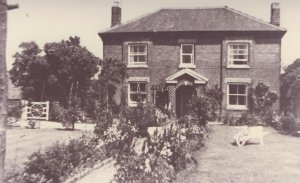 Duchy Farmhouse - since demolished. Listed as 68.4 acres in 1919 sale catalogue. 1871 "farmer of 12 acres". 1881 "farmer of 60 acres employing 3 men & 1 boy". Duchy Farm has been developed over and is now Duchy Close. Listed as 99.8 acres in 1919 sale catalogue. Middle Farmhouse is now a private dwelling. Listed as 295.1 acres in 1919 sale catalogue. 1901, 1905, 1914 & 1924. Bert Page is believed to have farmed this in the 1930's, until it was sold in 1939. Pastures Farm has been developed over and is now Btitten Close. Listed as 79.7 acres in 1919 Sale Catalogue. He was the ARP Warden for Chelveston during WW2. Top Farmhouse is now a private dwelling.